This is an easy one that will really add a little umph to the ponytail....and if you haven't noticed, I am a little partial to braids! With this ponytail, I did a side part and did the ponytail low. I really love the way that the side part looks for some reason. -Braid each section. I start with the center section, that way Piper can hold the other two. Secure with a rubber band. 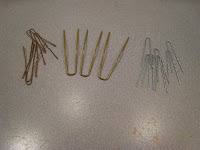 -Attach all three sections at the bottom with a rubber band, you will notice that your braids are most likely different length, so then I clip the other rubber bands. 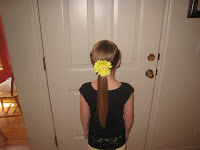 -Add a bow or flower at the top of the pony and curl the hair hanging out. -I also add a clip in the front. This took about 5 minutes. 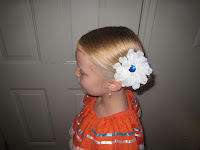 This is one of those hairdo's that is great for "one of those mornings." 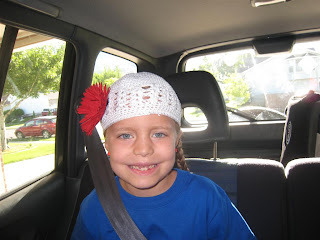 And, since she was playing 'Tessie' in "Annie" this same night, by the end of the hot un-air conditioned day, it was the perfect orphan hairdo. As long as you know how to french braid (which I will be doing a tutorial on...soon) you are set. 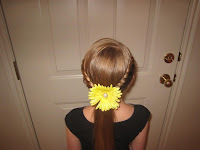 Usually when I french braid, I start out with a little section on the top of her head and when I add more hair, I just add a little at a time, and I pull it tight. Sometimes I braid over and sometimes I braid under (making the braid sit on top of the head). With this braid I start out with a big section of hair on the back of her head and when I add more hair, I add a lot and I keep it loose. I always braid over. Also, I don't braid it down to the end, I think it looks pretty with some hair left out (and curled...of course) and a pretty bow/ribbon. Since I knew she was going to be an orphan that night, I didn't use as much product as usual. It took about 3-4 minutes. Piper and I decided to start timing all of these lovely do's for you! Wow, the whole alphabet? K, let me work on that. I may have to do some recruiting here. I'll keep you posted. Piper use to have short hair, I would just do things on top, and curl the bottom until it was long enough. 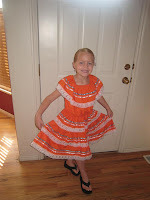 But I will see if I can find a little girl with short hair to do some stuff on. 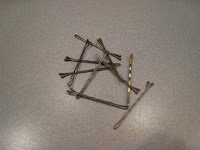 And, it is amazing what just a little clip or headband can do! Lots of hairspray, we use Sebastian Shaper and sometimes Paul Mitchell. 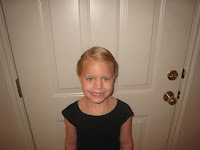 I put mousse in her hair while it is still wet, Paul Mitchell extra-body sculpting foam. It is easier for me to work with wet hair, not sopping wet, but we always have a squirt bottle. 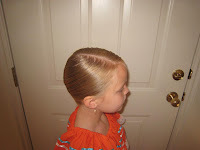 And, Piper has very straight hair (like I use to have) so when we curl it, we use Paul Mitchell Heat Seal. One good thing about Paul Mitchell is that a little bit goes a long way. I would say that for thin hair use water, mousse or gel and hairspray, but I am not positive on that. Once you get the hang of the styles, they really don't take that long. And if you are doing two sides the same, the second side is always quicker. The longest for me is the basket weave, and depending on how many rows I do, it takes about 30-40 minutes, but I am a perfectionist. 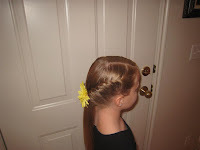 The french braided styles are about 10-20 minutes. All the others are about 5-10 and sometimes less depending on the time I have in the morning. Please, if you have any other questions, just let me know. So, I have all these great ideas for giveaways here on my little blog. For example: hair bows/flowers, hair tools, organizers etc...However, no one is leaving comments, so I have no way of knowing if people are interested in some of the things that I use. Comment today, so I know if this will be worth it or not. I have decided to do "Giveaway Wednesday" so, starting next Wednesday, July 2 I will have a giveaway posted on the blog and I will randomly select a commenter to be the winner. This will most likely not take place every Wednesday, but when it does take place it will be on a Wednesday! Piper says that she named this one "waterfall" because it looks like two little waterfalls meeting and turning into one. This is basically the same as a french braid, only with two pieces of hair instead of three. 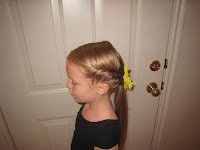 I start with a side part and her hair combed straight down a grab a section of hair on the right side and separate it into two pieces then proceed to twist, with each twist I grab a new section of hair (just like a french braid) and twist it into the twist. Am I saying twist a lot? Anyway I keep doing that until you get to the bottom. I secure the right side in a ponytail holder, then I do the whole twist thing again on the left side. I take the ponytail holder off of the right side and combine both sides into one with the ponytail holder, and I add a clip. For obvious reasons this hairdo is called "The X." I must admit here that I totally forgot to put product in her hair before I got started so she has fly aways all over the place. ARGH. To get started I parted her hair into four sections. Down the middle then across the back. 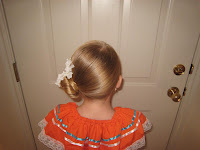 After I parted her hair, I put the bottom right section in a ponytail holder and the top left section in a ponytail holder to make sure that they stay out of the way. 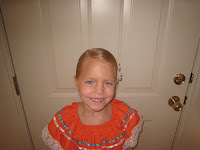 I french braided diagonally starting with the top right section to the center. When I got to the center, and had used all of the hair in this section I did a regular braid (about 2-3 crosses) until I got to the top of the bottom left section. Then I started french braiding diagonally again. Then I did the same thing on the opposite side.